Given the generous donations from our guests, I wanted to ensure the money got into the hands of the guides it was intended for. Having worked in Nepal for more than 25 years, the country that has given me personally and many of our guests such joy, needed help. Given the grand scale of the disaster from the April 25th and May 12th earthquakes, our response was always going to be a drop in the ocean. We wanted to help those close to us who have safely guided our guests down rivers and shared the love of their country with us. I wasn’t sure how I was going to find Nepal. I was a little nervous to be honest and was worried a lot about aftershocks and actually how I would find the vibrant city of Kathmandu. I was greeted at the airport by Chrish, smiling from ear to ear, who helped me with the 120kg of donated clothing, water treatment tablets, hand sanitizer and so much more which had been given by our generous guests. 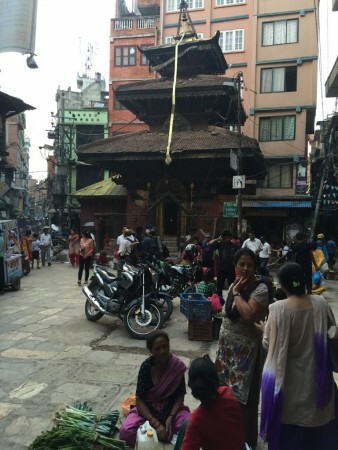 Life in Kathmandu continues on as close to normal as possible. The images we have all seen on television were horrifying and I expected to see mass devastation in and around Kathmandu. On the first day I arrived, I went to the Holy Lodge as I have done on many occasions before. The only difference being I was the only tourist in the hotel. Normally the basement would be full of travelers relaxing and eating momos (a tibetan dumpling) and sharing a cold Everest beer. I wanted to go for a walk and see the real Kathmandu and not just Thamel, the main tourist area. Chrish and I wandered the quiet streets and despite the quietness, a few things struck me. First, every Nepali I saw was smiling. They were genuinely delighted to see westerners in their country. Nobody was hassling you to buy anything, but were delighted if you popped into their shop, restaurant or barber to give them some custom. Sure some buildings had some damage, but this was certainly rare, rather than common. I guess the images I was placing my ‘opinions’ on were the horrific images I had seen of the damage in iconic places such as Bhaktapur. With the massive amount of clothing etc, you donated, we were able to give every child at the school in Bansangu (Chrish’s village) at least 4 pieces of new clothing each. It was really moving, to see how this small act, benefited so many. The young girls loved the blouses, rain wear (monsoon is just starting) and the young boys tried on new gumboots with pride. You have also managed to outfit the school with new books and pens for the children to work with. This will be a continuing effort on our part to help this school. 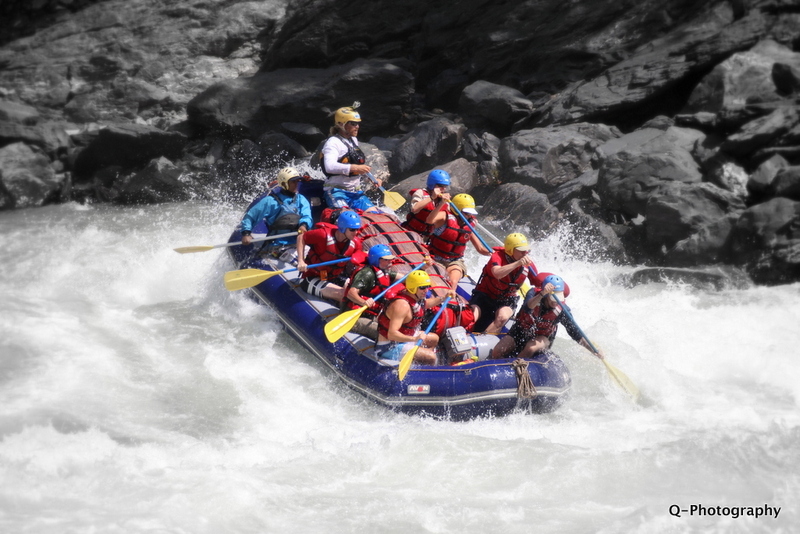 Our guides out there are in a myriad of situations and circumstance. We wanted to divide your donations up amongst them, evenly and fairly. 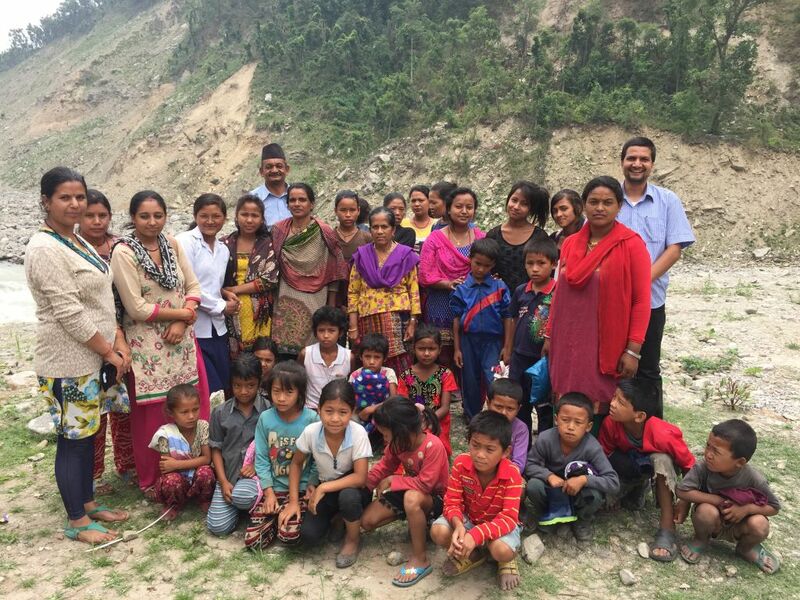 Each of them received 100,000 rupees, with a little extra being used to help a local school in the vicinity of the Bhote Kosi before it flows into the Sun Kosi River. This is a little about the wonderful people you helped. Maybe you know some of these people, maybe you have yet to meet them, but they are simply wonderful. Chrish: This wonderful man has been working with us for many years as a safety kayaker and guide. I don’t think I have ever heard Chris complain and he rarely is not smiling. Chris and his wife have an 8 month old son. Last year on August 1st 2014, Chris lost his Mum and Dad and three sisters in a huge landslide on the Bhote Kosi river. His village is called Bansangu and just 50 people live there now. Pre landslide was a few hundred. 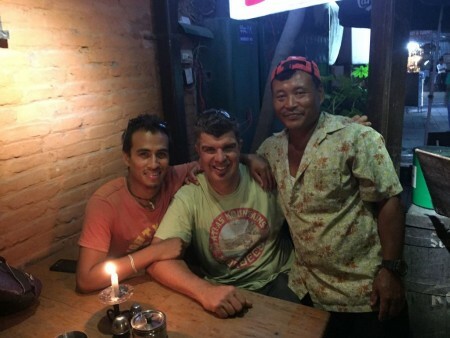 Hamish caught up with most of the guides including Chrish and Kamal. Kamal: A man of few words who has rowed many gear rafts for us over the years. I was happy to see ‘rhino’ and his smiling wife meet us in Kathmandu, the night before I left. Although damage where he lives is limited, the expected downturn in tourism will effect him directly. Arun: A young trainee guide I met for the first time in October 2014. He comes from a small village devastated by the earthquake called Lamosangu. He is setting up a mobile phone shop, so people in this area, can communicate better with their families and friends. Suzan: This tall likeable guy was injured in the earthquake on April 25th. He is using your assistance to put his 2 brothers aged 13 and 16 through school. In a time such as this, family is even more important. Bahadur: This literally means ’strongman’ in Nepali. Bahadur has rowed so many gear rafts for us over the last 18 years operating in Nepal. Unfortunately, he lost his wife in the first earthquake and now he takes care of his 7 children alone. Again, another such happy soul, who was genuinely moved by your generosity. Kamal Bhandari: Stan and I have worked with this character since he was a trainee. He is now married and is expecting his first child in October. He is currently away working in Japan, while his wife remains at home. She will now be able to make the necessary repairs to their house. Indra: Another extraordinary and talented safety kayaker. He is currently trying to earn money in Malaysia before returning for the rafting season in September – November in Nepal. Nepalis are scared. They are scared that people will stay away and they will not come to Nepal. They know people are scared of aftershocks and how they will find their wonderful country. As a nation, they are also incredibly resilient. Thank you each and every one of your who gave. Thank you for sharing. We are just messengers to deliver your help. We are happy it was and is being directed to those we know and care about. But just because this has fallen off the news, these guys are dealing with this constantly. If you are able to spare any further help, we are still collecting for the guys to support them. Please share with family and friends, these wonderful people will be most grateful. Are The River Areas Safe? The Karnali river was unaffected in the west part of the country. There is no earthquake damage here at all. The Sun Kosi has had limited damage, but higher up river than we start the river trip. Just think of all the great new rapids! The Tamur in the far East has again not been affected by the earthquake. Small villages such as Dobhan, Gufa Pokhari and Chauki rely on rafters as well as people trekking to Kanchenjunga base camp for their livelihoods. In Nepal, corruption is rife. Help does not get to the people who need it most. 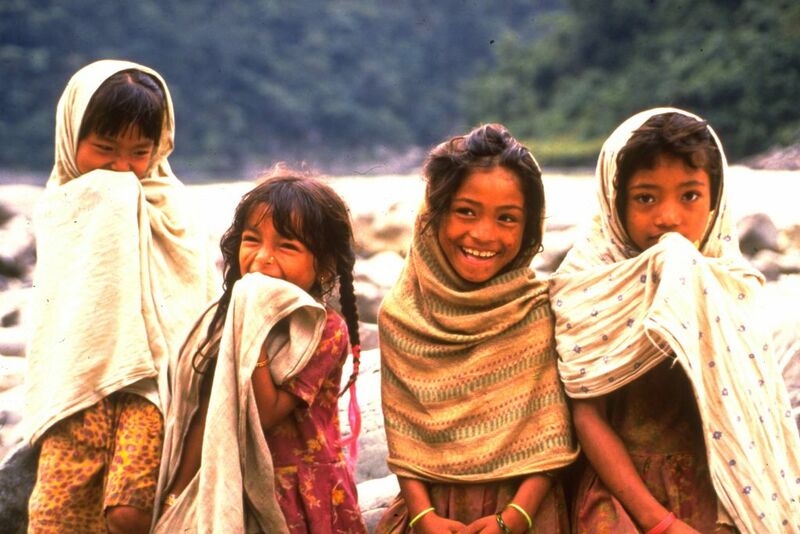 A lot of aid does not trickle down to regular Nepalese. When I arrived into Kathmandu, I was shocked at the amount of aid, just sitting on the tarmac at the airport. Organizations are doing a marvelous job out there and helping people in remote villages as best they can. The government is implementing a 46% tax on tents for example, even on aid entering the country, this goes into the ‘government pot’ to distribute but of the billions sent, almost all is spent. On what we ask? What will really push regular Nepal people is if the thousands of tourists stay away. So if you can, if you feel able, if you are not scared, then take a trip to Nepal. You’ll be rewarded in so many ways. We’ll also donate 5% of our Nepal sales to go directly to the Guides Fundraiser.